The original Zero Tolerance 0454 was an award-winning collaboration between ZT and custom knife designer Dmitry Sinkevich. But it was also a very Limited Edition knife. To make this amazing knife more readily available, ZT Knives has created a new-for-2015 version based on the original's streamlined form and high-performance function. To make this amazing knife more readily available, ZT Knives has created a new-for-2015 version based on the original&apos;s streamlined form and high-performance function. 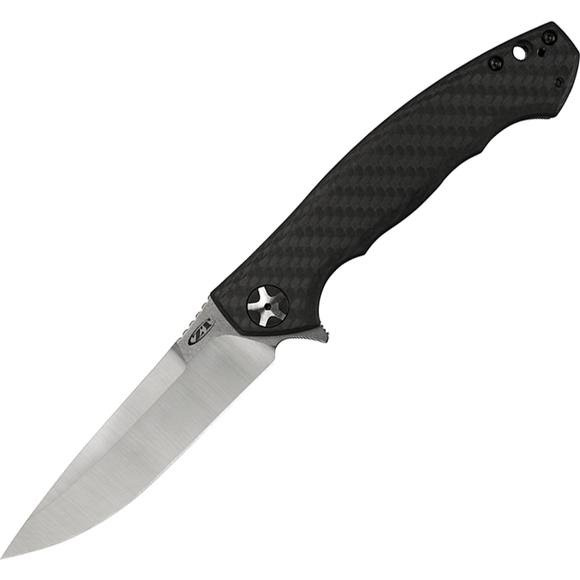 The 0452CF is the same size as the original 0454, but with a carbon fiber front scale and S35VN dual-finished blade. S35VN sharpens to a razor edge, holds it, and can be resharpened easily. The 0452CF Sinkevich Folding Blade opens as smooth as butter with the KVT ball-bearing opening system and built-in flipper. A titanium frame lock with hardened steel lockbar insert ensures solid lock up. As a final touch of class, the 0452CF features handsome 5-spoke pivot hardware. From office to outdoors, the 0452CF is ready to go wherever you&apos;re ready to take it. The KVT opening system is a manual opening system that enables smooth, easy blade opening without the use of a spring or torsion bar to "assist" the blade out of the handle. Instead, the KVT system uses a series of ball bearings that surround the pivot point of certain ZeroTolerance folding knives. As a knife user pulls back on the flipper blade protrusion or pushes outward on the thumbstud, the ball bearings rotate so that the blade glides out of the handle then locks into place, ready for use. Zero Tolerance folding knives most often open with a "flipper". The flipper is usually a part of the blade that protrudes at the knife spine when the knife is closed. When opened, the protrusion forms part of the finger guard. Flippers may be found on both manual and assisted opening ZTs. In a frame lock knife, the knife handle - its "frame" - consists of two plates of material on either side of the blade. To ensure a secure lock up, one or both of these plates is usually metal. When the knife is opened, the metal side of the frame, the lockbar, butts up against the backend of the blade (the tang) and prevents the blade from closing. To close a frame lock knife, the user pushes the frame to the side, unblocking the blade, and folds the blade back into the handle. Like locking liner knives, frame locks are manufactured so that the locking side of the frame is angled toward the interior of the knife, creating a bias toward the locked position. Both the blade tang and the lockbar are precisely angled so they fit together for a secure, reliable lockup. The thickness of the frame material blocking the blade open makes the frame lock extremely sturdy. Zero Tolerance pocketclips are selected to be compatible with the style and materials of the knife. In addition, the position of the clip may also be determined by the position of the knife&apos;s other hardware, especially the pivot point and locking mechanisms. ZT handles are pre-drilled so you can change the position of the pocketclip. Reversible offer two pocketclip position options. The new deep-carry clip enables the knife to sit far down in your pocket. Crucible&apos;s S35VN modifies the formula of S30V for enhanced toughness and resistance to edge chipping with no loss of wear resistance. Its formula promotes the formation of niobium carbides along with the vanadium and chromium carbides. It provides a sharper, longer lasting edge. Carbon fiber is composed of carbon atoms bonded together to form a long chain; they are extremely strong and lightweight. These carbon fibers are woven together, then layered with epoxy and compressed under high pressure to create the carbon fiber sheet from which we make the handle. Titanium is a lightweight, corrosion-resistant metal with high tensile strength. ZT uses it as a handle material, a liner, a lockbar, or as part of a performance-enhancing coating.